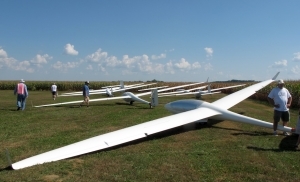 Founded in 1959, the Minnesota Soaring Club (MSC) is governed by an elected Board of Directors and a set of by-laws and is a chapter of the Soaring Society of America. For club history, see the the msc_history_presentation. The club is run by volunteers. Members are expected to be available for scheduled field duty such as moving the equipment to and from the runways, performing daily inspections, scheduling flights, and helping with towing and instructing when qualified. Flight time and tows are charged at rates well below commercial alternatives and there is no charge for instruction. Please read the MSC Brochure 2019 for a summary of the club membership structure and costs, and for a membership application form. Sailplanes in America are licensed by the FAA, and pilots must have a pilot certificate with glider rating to fly them without an instructor. Unlike powered aircraft, neither a FAA medical certificate nor “BasicMed” certification are required to fly gliders. See CFR 61.23b and CFR 61.53b for details. With a current biennial flight review: the instructor will brief the pilot on local operations and conduct one or more orientation flights. When the instructor is satisfied they will endorse the membership card of the pilot. Without a current biennial flight review: the instructor will conduct the flight training portion and schedule the required ground portion. On completion they will make the log book entry certifying the completion of the review and endorse the membership card of the pilot. Holders of a valid FAA Power plane license with 40 hours as pilot-in-command need a minimum of 10 solo flights to qualify to take the glider flight test. No written exam is required to add a glider rating to a power license. The flight test will be conducted by an FAA Designated Flight Examiner. Student pilots may solo at a minimum age of 14 with a student certificate endorsed for solo flight at the discretion of a FAA-Certified Flight Instructor. Generally, 30 to 40 flights with an instructor are required to solo. This is roughly equivalent to 10 – 12 hours of flight time and is dependent upon the progress of the student. Sometime between the beginning of training and before the first solo flight it will be necessary to obtain a student pilot license from the FAA. This is a simple matter of visiting an FAA office, presenting identification, and completing some paperwork.